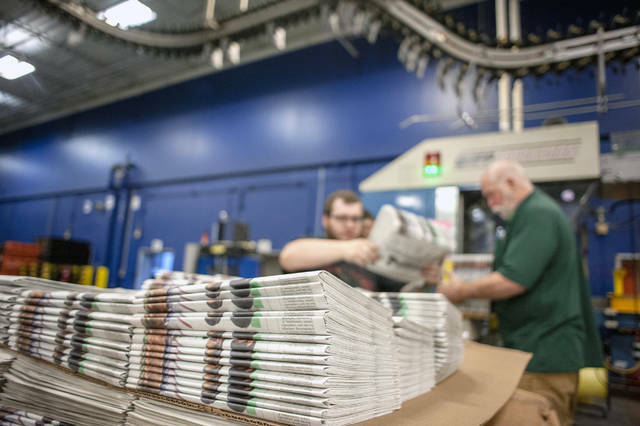 WASHINGTON (AP) — About a dozen members of Congress warned Tuesday that newspapers in their home states are in danger of reducing news coverage, laying off workers or going out of business if the United States maintains recently imposed tariffs on Canadian newsprint. About a dozen lawmakers testified against making the tariffs permanent during a United States International Trade Commission hearing. The commission is reviewing whether U.S. producers of certain groundwood paper products, including newsprint, have been materially injured because of the imports from Canada. The commission’s findings help determine whether the Department of Commerce makes the tariffs permanent. Newsprint is generally the second-largest expense for local papers. The tariffs have generally increased newsprint prices by 25 to 30 percent. Sens. Susan Collins and Angus King of Maine both argued that the tariffs will hurt the industry they’re designed to help because it will diminish the market for newsprint in America as newspapers shrink or close. “If you end up with a smaller market, you haven’t helped anybody, let alone the plant in Washington that is petitioning for this help,” King said. The newsprint tariffs reflect President Donald Trump’s tough new approach to U.S. trade relations, but they are separate from other high-profile trade actions taken in recent weeks. The administration has also sought to curb imports from China and steel and aluminum imports from a range of countries. The lawmakers who testified included Republicans and Democrats from a broad cross-section of the country. No lawmaker testified in favor of the tariffs. Sen. Roger Wicker, R-Miss., said the tariffs have led to surprise newsprint shortages and price hikes across the Southeast. He said papers in Vicksburg and Natchez have cited rapid increases in newsprint costs for cutting their print paper to five days per week, instead of seven. “It defies logic that NORPAC, just one mill located in the opposition end of the United States, can create this type of disruption and uncertainty,” Wicker said. NORPAC stands for the North Pacific Paper Company. It employs about 300 people. Company officials told the commission that prices had dropped so low for its paper that it could not justify keeping all three of its machines running. But since the imposition of the tariffs in January 2018, prices have recovered to the extent that it was able to hire back 60 employees and restore pay and benefit cuts made in 2017.